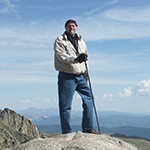 About 1 month ago: James S.
Terrific retrospective of what it took to bring this now irreplaceable trail to the community; brimful of ideas and lessons for us as we grow and connect our trails network in North Texas. Thank you, Bud. 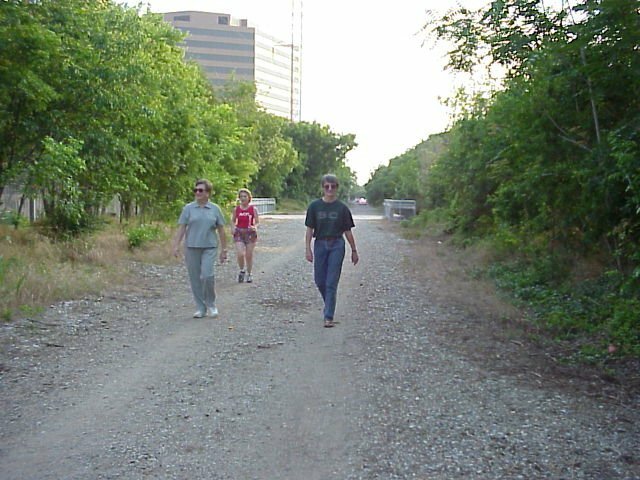 The Dallas Katy Trail grew out of a roughly 3.5-mile stretch of the Missouri-Kansas-Texas Railway line that roughly parallels Central Expressway from the thriving mixed-use urban center Mockingbird Station to the rapidly reinventing Victory District near downtown Dallas. Historically, that rail line — first when active and later when abandoned — acted as a prominent barrier, or dividing edge, both socially and economically, separating neighborhoods and families. On one edge stood duplexes over 50 years old, interspersed with the occasional single-story commercial building; on the other, a high-income single-family neighborhood in Highland Park. The Katy Trail has become one of many urban edges — or seams — upon which growth, new developments, and hopes and dreams are now traversing. In the early 1980s, DART light-rail transit was but a gleam in the eyes of city visionaries. Voters in Dallas were among those in the county, plus 13 other cities in the region, to agree to dedicate a portion of sales tax revenues to create a regional light-rail transit network. The vision was that the LRT stops would eventually become nodes for denser and more connected developments. The MKT line was a candidate for the DART system. Many cities voted to support it, but Highland Park wasn’t among them. 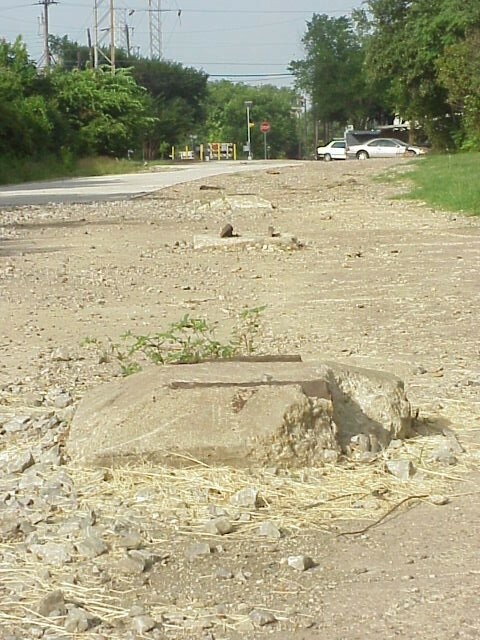 Highland Park residents wanted nothing to do with an active rail line behind their homes. As the transit agency’s plans took shape, outright opposition to a DART line along those tracks reached a tipping point. The light-rail alignment was moved to a subway tunnel beneath the soon-to-be reconstructed North Central Expressway/U.S. 75. That 3.3-mile portion of the MKT line, then owned by Union Pacific, was instead donated to the Dallas Park and Recreation Department. Graduate landscape architecture students from University of Texas at Arlington created an impressive array of concepts and a plan, and the MKT was renamed the Katy Trail. Round 1, won and done! Historically divided Uptown and Oak Lawn were among early participants in determining the future for land uses within the adjacent areas. Historically significant homes were being scraped away to widen Central Expressway and build apartments. Leaders in the Oak Lawn Forum, a community group focused on urban redevelopment, saw an urgent need for a historic overlay that allowed for mixed uses and denser residential neighborhoods, bordering Turtle Creek and the old MKT alignment, while preserving established housing stock in stable neighborhoods. A Planned Development (PD) was established in response. PD-193 was instrumental in a bringing about more responsible blending of redevelopments in the adjacent areas, Dallas architect Philip Henderson, FAIA, recalled. 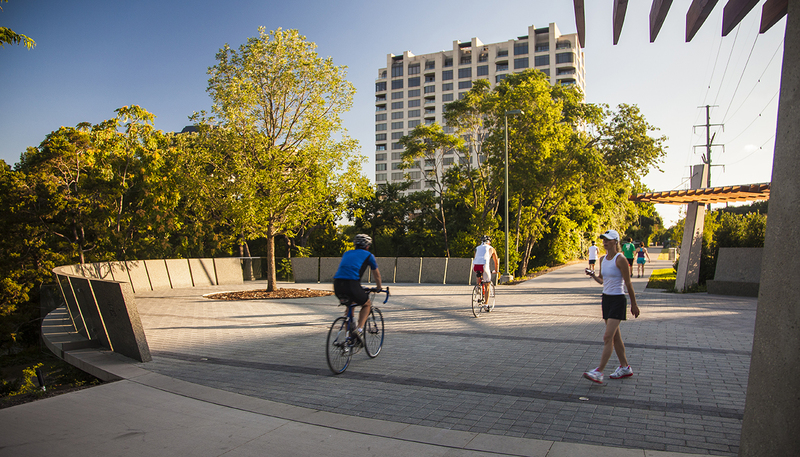 The overlay required new developments to share the cost of recreational infrastructure needed by new tenants in the area. Other civic leaders saw the abandoned Katy line as another opportunity for greatness. Harvard-trained planner and landscape designer Raymond Entenmann and Oak Lawn Forum leaders Cay Kolb and Dedo Kidd reached out to philanthropist Margaret McDermott, Hon. AIA for funds to hire an executive director to help lead the implementation – and invited Henderson to take the gavel as its president. Henderson focused on using his experience as an architect in getting the partially-funded project implemented. But his group’s interest reached far beyond a simple hike and bike trail. But he quickly acknowledges there’s not an adequate framework. Not enough civic leaders have yet accepted a role in significantly enhancing past public investments in trails and greenway assets. To them, he says please look at the numbers, and at the results. Aaron Abelson of HR&A Advisors Inc. sees multiple dimensions of value creation associated with investment in trails. From increasing nearby real estate values to accelerating development— and attracting tourist dollars — trails generate economic value for cities and communities, Abelson asserted. 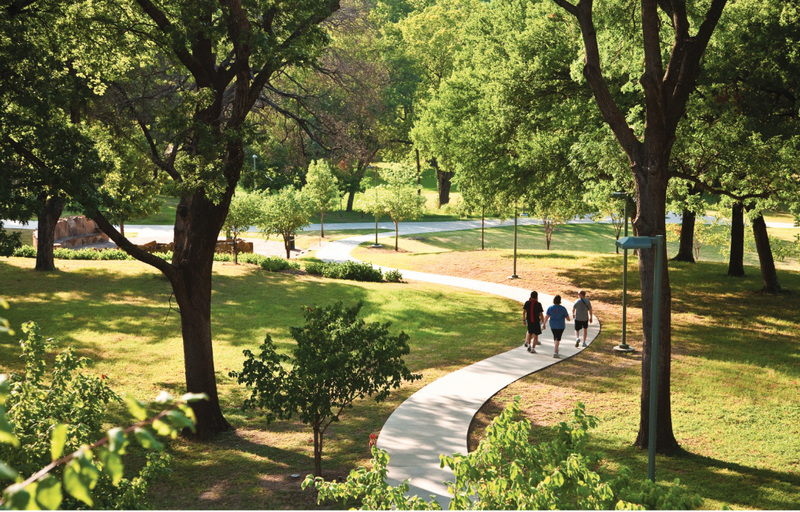 In a study of the Dallas parks system, HR&A found that trails generate the highest return on investment, at over 50:1, of any type of park. 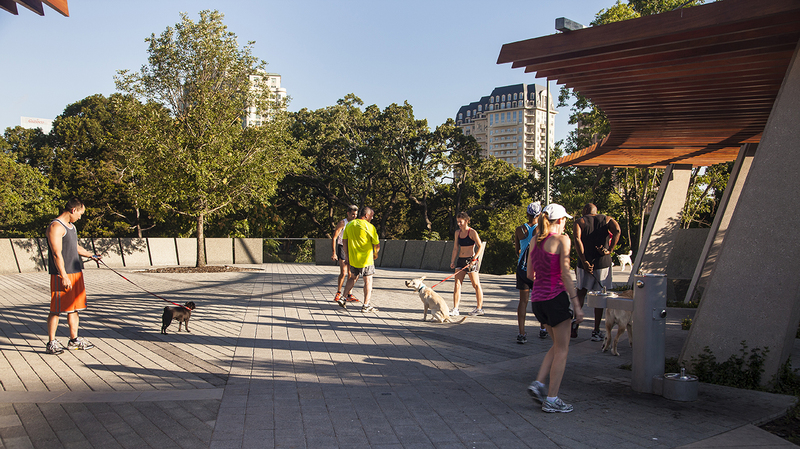 The study found Dallas residents, much like those in other U.S. cities, are attracted to, and will pay more for, real estate near trails because of their recreational and other amenities. Not only do trails produce a price premium for homes adjacent to or a short walk away from them, but they also touch more properties per acre because they are linear, greatly maximizing their economic value. The study determined that the Katy Trail has created about $880,000 per acre in real estate value over the last 18 years, Abelson said. 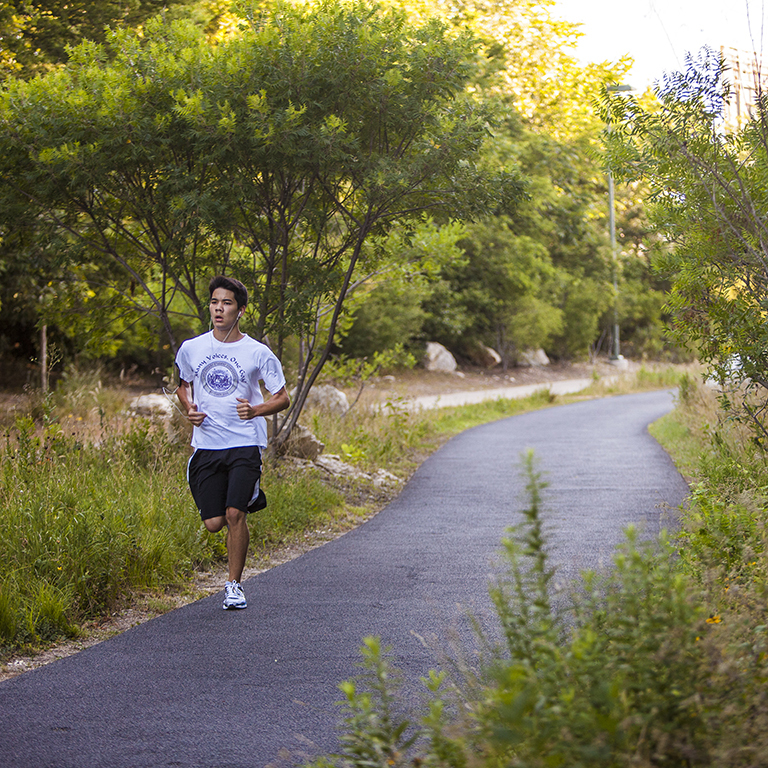 “With cities striving to stretch every dollar available for parks and trails, development of multi-use trails continues to provide significant measurable benefit,” he concluded. The Katy Trail Master Plan prepared by SWA Group - note the "Old Trinity Trail" was renamed the "Trinity Strand" in 2006. The City of Dallas recently adopted a park land dedication ordinance that requires builders to set aside park land for new developments. Proponents, including the Greater Dallas Planning Council, say this will help neighborhoods remain balanced in the availability of park and open space. Dallas is known for benefactors stepping forward to enhance and beautify these facilities, often adding form and function to the initial layouts. But beyond initial capital expenditures, there’s still no broad-based method of maintaining these investments. To address operational and maintenance costs, some cities and counties elsewhere are enacting annual assessments dedicated to the stewardship of their park and trail investments. In the state of Washington, Kirkland voters approved in 2012 a proposition to fund restoration, maintenance, and enhancement of the city’s network of parks and trails. Planners said the $2.35 million-per-year levy will help the city complete a series of vital projects including helping the city transform an old rail corridor into an interim bicycle and pedestrian trail. Cincinnati, however, unsuccessfully asked voters to support a citywide property tax levy which would cost homeowners $35 annually per $100,000 in value. In Seattle, voters passed a 2008 Parks and Green Spaces Levy of $146 million over six years for park and trail improvements and acquisitions, in addition to creating a $15 million Opportunity Fund allocated to projects identified by neighborhood and community groups. A critical question for Dallas and surrounding cities: Are we at a time where area stakeholders would sufficiently support funding for stewardship? 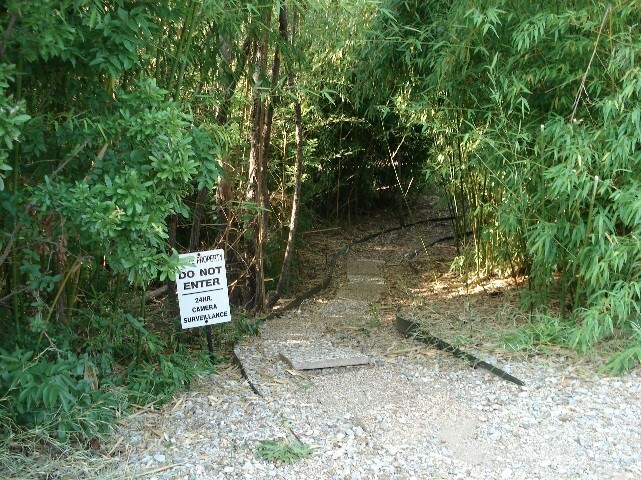 As of this writing, numerous trail stakeholders said they’re relying on the city to enhance or even adequately maintain trails that, like the Katy, need additional resources. Most organized friends groups seem to have the same concerns. When asked whether an annual assessment based on proximity might be palatable, Mike Kutner, an area property owner and founder of the Trinity Strand Trail, indicated that it might be fair for properties within a quarter-mile, given their premium rents and sale prices. But he finds many apartment builders seem unwilling to go along. Education and stakeholder involvement are essential to arriving at a fair amount, he said. Neal Sleeper, developer of Cityplace, developed West Village, a pedestrian-friendly mixed-use project that benefits from its proximity to the Katy Trail, considers the Katy to be one of the most important projects in the area, “even more important than McKinney Avenue” in its value to apartment developers. He’s developed two projects adjacent to the Katy. “I sold land adjacent to the Katy too early during development of the trail,” he said. Like many others, he didn’t realize the potential then. 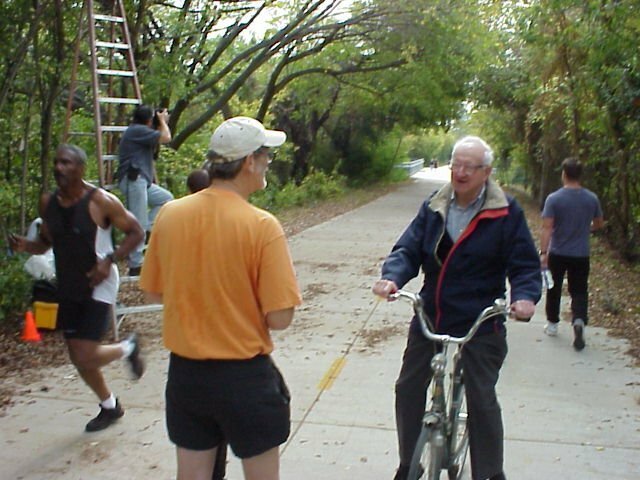 Most multifamily developments are pleasant to view from the trail, “but some have slammed parking garages or blank walls too close to the trail, which is a missed opportunity and disservice to the trail.” He said Ross Perot, Jr. is getting it right with his connection to the trail from his family’s new Turtle Creek campus, as is Leon Backes of Provident Realty Advisors, who Sleeper says, set his development back for a better relationship with the trail. But the city prohibits overlaying Public Improvement Districts, Sleeper said. Uptown does contribute to the Katy up to Blackburn, and a sliver at Knox Street gets funds. 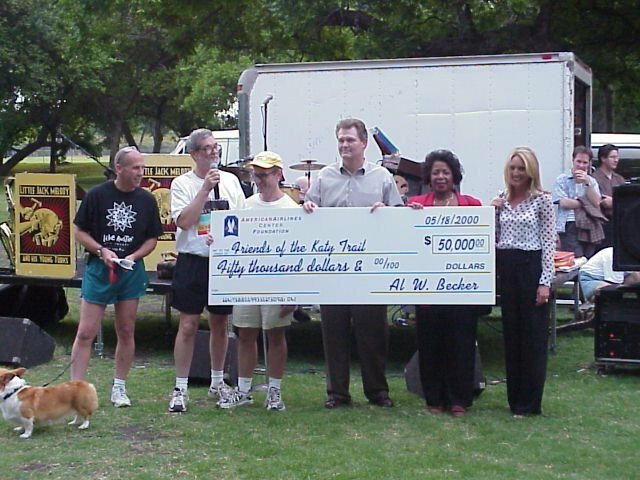 But most trails like the Katy, the Santa Fe and the Trinity Strand rely on supporters’ generosity. Some have suggested implementing some sort of revenue enhancement, or setting aside a portion of local sales tax revenue from commercial retailers benefiting from the trails. Are we approaching an inflection point where adjacent beneficiaries may be willing to share in the bounties of trail connectivity? That’s an important question. Bud Melton is special projects manager with Halff Associates Inc.